Peter Crump joined the Luftwaffe in 1937. He was posted to JG 53 following his flying training in 1940. Here he was grounded and sent back to Germany to undertake general military duties. A year later he was permitted to rejoin the Jagdwaffe but he was required to repeat his fighter pilot training. Crump was posted to JG 26 in mid June 1942 following completion of his flying training. Unteroffizier Crump was assigned to 5./JG 26 based at Abbeville in France. He gained his first victory, a RAF Spitfire fighter, near Berck sur Mer, on 27 August 1942. Crump received promotion to Feldwebel in April 1943. On 22 June, Crump brought down a USAAF B-17 four-engined bomber near Vlissingen but his Fw 190 A-4 (W.Nr. 793) “Black 6” was hit by escorting USAAF P-47 fighters. He was wounded and required to make a force-landing. To add insult to injury the B-17 was not confirmed. 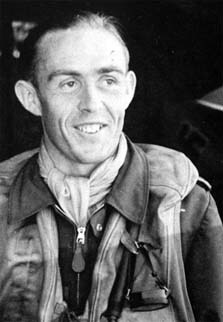 He was shot down by P-47 fighters of the 78th Fighter Group, USAAF on 22 February 1944. He baled out of Fw 190 A-7 (W.Nr. 340 253) “Black 14” very low, landing after only one swing in his parachute, but suffered only minor injuries. However, his injuries were to keep him out of action until late April. He transferred from 6./JG 26 to 7./JG 26 at this time. By June, Crump had been promoted to Oberfeldwebel. On 17 June, he was promoted Leutnant after 15 victories in 150 combat missions. On 13 July 1944, Crump was transferred to JG 54. He claimed three quick victories with III./JG 54 before being withdrawn from the front and rested at the Fighter Pilot’s Rest Home at Bad Wiessee. He rejoined the unit after it was withdrawn from the Channel front. Leutnant Crump was appointed Staffelkapitän of 10./JG 54 when this unit was transferred from the Eastern Front to the Western Front on 25 December 1944.  On 25 February 1945, III./JG 54 was incorporated into IV./JG 26 and Crump became Staffelkapitän of 13./JG 26. He assumed command of 5./JG 26 on 17 April but was too ill with blood poisoning to fly. On 1 May, Oberleutnant Crump was appointed Staffelkapitän of 1./JG 26. On 2 May, he flew his last combat mission of the war. Peter Crump was credited with 31 victories in 202 combat missions. However this could include a number of unconfirmed victories. All his victories were scored on the Western Front and could include up to seven four-engined bombers. 13:46 Mustang 5./JG 26 S Montreuil Mustang I of 168 Sqn RAF flown by F/O IG Grant, POW?